Construction Site Fire Safety Manager – NY Fire Consultants Inc. 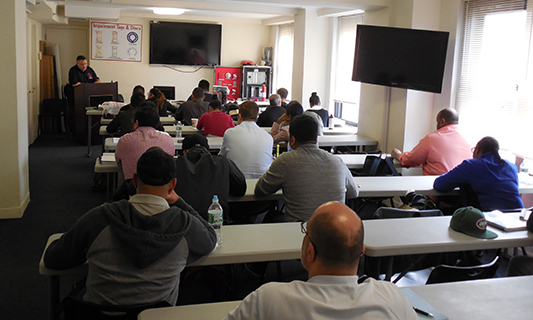 This is the New York City Fire Department (FDNY) certified course for the Construction Site Fire Safety Manager. It consists of two 5-hour classes. The S-56 Certificate of Fitness is required where a Site Safety Manager or Site Safety Coordinator is required by the Building Code for a construction site. The Construction Site Fire Safety Manager (CSFSM) shall conduct an inspection of the construction site and all fire safety measures on at least a daily basis, and maintain a record when construction, demolition and alteration work is being conducted. Download the FDNY Notice of Examination, which includes the application, procedures and requirements to become a certified Construction Site Fire Safety Manager. All classes are taught at The NY Fire Safety Institute, in Suite 618, Wyndham New Yorker Hotel, Suite 618 (8th Avenue at West 34th Street). See below for directions. Our weekday classes are held on weekday evenings for a total of two (2) class sessions. If you need to register more than one student, you must login or create a free account first. It's quick and easy! Classes are held when needed. If no date is listed call for more information.